The first in this series, Doon, changed my perspective on fairytale/princess books altogether. I loved every minute of it. I am happy to say I was not disappointed at all with this sequel. 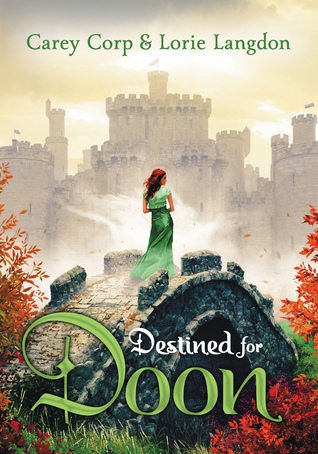 Destined for Doon is anything but your basic fairytale. There is no damsel in distress who needs rescuing , no prince who comes to save her, nor a song after every major scene. Instead, this book is full of humor, musical references, heartbreaking teen romance, unbreakable friendship, and an evil witch that must be stopped. Although Destined for Doon was a strong sequel, I would not say it was without its imperfections. Between the two authors and the switching back and forth of perspectives after every chapter, I would say there were times where I felt as though the writing style simply didn’t work. There were moments where it would have flowed better to stick with once voice over another. Despite a few flaws, Destined for Doon was good considering it was a sequel, and although it wasn’t perfect I would still recommend it to fellow readers, especially considering it has stuck with me nearly two years after reading it. So go visit the world of Doon; you won’t be disappointed.